Crude oil prices extended their declining streak in Monday's trade as investors continued to worry about the commodity’s demand prospects amid slowing US economy and deteriorating European debt situation. Risk aversion was evident across most risky asset classes as the strength in American greenback made dollar denominated commodities costlier for overseas investors. Benchmark crude for November delivery plummeted $1.30, or 1.5% to $77.90 a barrel on the New York Mercantile Exchange. 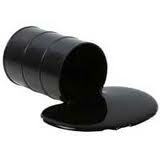 In London, Brent crude for November delivery shed $0.92 or 0.9 percent to $101.84 a barrel, on the ICE Futures exchange.